Review: We should make our own comics! This is exactly how Lila and Ecco (and maybe even Ruby!) feel in by Willow Dawson. Eleven year olds, Lila and Ecco (and you!) are learning about how to create comic books, step-by-step in this comic book. As they are learning about making a comic book, they decide to make one too. . .
As Lila and Ecco go to an annual comic convention, they run into a room in which a few artists are talking about the basics of comics and how to create comic books. The problem is that Lila and Ecco can't memorize all this on the exciting drive home- so they grab a booklet and follow the steps to make a comic. As the kids meet again, they start to make a comic book, following all the steps in order while taking care of Lila's younger sister, Ruby. As annoying as she is, she is being used to show examples of comic book traits in this how-to book. Lila and Ecco's Do-It-Yourself Comics Club is a comic book that explains how to make a comic book. What I like about this book is that the characters are explaining how to make a comic book while pointing or demonstrating how it works. This book also shows some flashbacks while they are talking in case you forget something the character said earlier. One of the cool things I didn't notice at first is that the name of the chapters corresponds with what you are going to learn in that chapter. The focus of Lila and Ecco's Do-It-Yourself Comics Club isn't really the plot, it is how to make a comic book, therefore, the ending isn't mind-blowing, but it is still kind of surprising. If you like comic books or are interested in making a comic book, I suggest you read this book. We would like to thank Raab Associates, Inc. for providing a copy of Lila and Ecco's Do-It-Yourself Comics Club for this review. 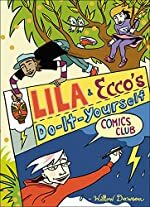 Have you read Lila and Ecco's Do-It-Yourself Comics Club? How would you rate it?